Telecare’s San Diego Assisted Outpatient Treatment (AOT) program opened the doors to their new facility on August 26. Created in partnership with San Diego County Behavioral Health Services, the San Diego AOT program celebrated their new facility with an open house which was attended by many community providers and San Diego County Administration. The San Diego AOT program launched on April 1 and is the first Laura’s Law program in San Diego County. Laura’s Law is legislation that allows for court-ordered intensive outpatient mental health treatment to individuals who have not accepted treatment and meet the nine criteria listed in the law. Referrals for the San Diego AOT program are coordinated through the county’s two In Home Outreach Team (IHOT) providers— Telecare and Mental Health Systems Inc.— to ensure that services are available to all residents. Originally created as an alternative to Laura’s Law programming, IHOT staff go into the community to engage hard-to-reach individuals who are in need of mental health services. If the individual refuses, but meets the nine criteria, they then may be court-ordered to receive treatment in the AOT program. (L-R) Leslie Barden, Scott Jackson, Elvia Escobar, Natalie Blair, Christine Ortego, Jane Flaherty, Zenaida Vega, Amy Siez, Sandra Tello, Vivian Alvillar, and Martin Ponciano. (L-R) Jane Flaherty, Scott Jackson, and Vivian Alvillar. Explore Our Court-Ordered Care Newsletter. Explore Our Roundup of Telecare’s Court-Ordered Care Programs. Click to see the success of Telecare’s AOT program in Orange County. Last month, Telecare opened its first Laura’s Law program in Alameda County. The Alameda Assisted Outpatient Treatment (AOT) / Community Conservatorship (CC) program provides individuals who are living with a mental illness, who have been involved with the justice system, or have had repeated hospitalizations, with a safe course of care. The AOT-CC’s goal is to help individuals to achieve recovery and reduce system costs. The program collaborates with the Public Guardian/Conservator’s Office, Alameda County’s four new IHOT teams, and John George Hospital, to engage individuals not effectively connected with the system of care, or who are overly connected to highly restrictive services such as the prison system or hospital emergency services. Individuals are recommended for participation in the CC program by mental health professionals within John George Hospital in San Leandro, CA. Both AOT partners and CC partners will receive the same ACT-level services from the small but mighty AOT-CC team. Because this is the first of its kind in Alameda County, family involvement and peer advisory will be emphasized in the AOT program. “People are really excited that we are engaging families and will be giving them a way to participate and provide feedback on how the program provides care,” said AOT-CC Clinical Director Penny Bernhisel. The program has a Family Advisory Board that meets on the third Thursday of the month and a Peer Advisory Board that also meets once a month. 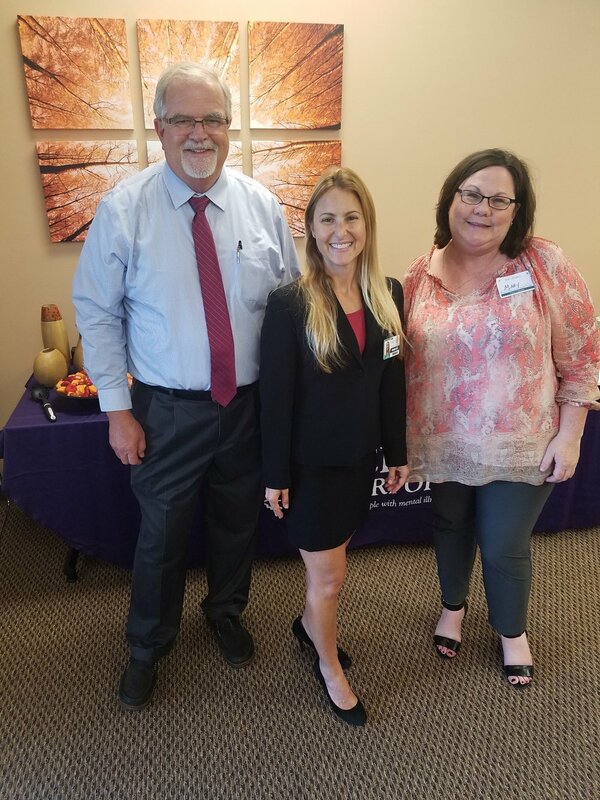 Telecare is pleased to announce the opening of our fourth Laura’s Law program in California, created in partnership with San Diego County Behavioral Health Services: the Telecare San Diego Assisted Outpatient Treatment (AOT) Program. Our AOT programs offer wraparound, intensive supports for people who are court-ordered into care after meeting specific Laura’s Law criteria. San Diego County’s Board of Supervisors approved the implementation of Laura’s Law in April 2015. This new AOT program enables the county to expand its safety net to people who need mental health services but have not been willing to engage in treatment. The AOT program will operate in tandem with existing voluntary services called In Home Outreach Teams (IHOT). Residents in the north regions of San Diego can contact Mental Health Systems Inc. for IHOT referrals; residents in the central, east, and south regions can contact Telecare’s IHOT program. The IHOT teams will do their best to engage people in services on a voluntary basis. If a person refuses services, but meets the nine Laura’s Law criteria, the individual can be mandated into the AOT program to receive the support and services needed. “Although the IHOT programs have been extremely successful in San Diego, the option of AOT is a valuable, additional tool we can use to help these individuals stay in contact with mental health resources that are designed to help them function more safely and securely in the community,” said IHOT Administrator Roselyna Rosado. More about how IHOT and AOT link services and referral information can be found here. Mendocino County: Approved November 2014. Postponed opening.